I mean…is that supposed to make me okay with using the wrong pictures on the wrong posters? He’s at least wearing the right costume. I also noticed Han in ROTJ is another ANH photo. No, it’s just something else to point out. I like this crossover. I tried my best for making prequel styled posters for The Force Awakens and The Last Jedi. The ESB one bugs me. Han is from ANH, Leia is from ROTJ. Also I don’t like that they recreate the prequel posters precisely, down to the same layout of characters, rather than try to make a new poster in the same style. Look at Luke in the poster for A New Hope. That was a promotional picture that was taken of Mark Hamill in the farm boy outfit after the trilogy was complete. I don’t know if anyone has seen these posters of the Original Trilogy made in the style of the Prequels. Has anyone thought about making posters for the Sequel Trilogy in this same style? I made some for The Force Awakens and The Last Jedi, but they aren’t that very good. I have been trying to find out how I can acquire kk650’s color regrades. He has been gone since April 2018, and I haven’t heard from him since. You usually could send him a private message for a regrade, but he hasn’t been around. I heard that they are also on MySpleen, but I can never get into the website, nor do I have an account on there. I’ve been hoping to acquire his Star Wars and DC color regrades, but I don’t know where to get my hands on them. Please let me know where they can be acquired. Thanks. They always make the game seem perfect, then comes launch. I didn’t buy Battlefront 2 until after they confirmed a change in micro transactions. I bought it not feeling ripped off. Well, that can be said about new EA games. Old games that EA doesn’t really put out anymore I would say are safe to buy. I don’t know about you, but I always wait for the reviews to come in before I buy an old game. I think that Rey took the sacred Jedi texts because, while Luke preserved them, he wasn’t putting any use to them. Rey is still young and has much to learn, despite having more patience than Luke did in the Original Trilogy. Rey may have taken the books, but it isn’t anything bad of what she did. Yoda already knew she had taken them when he struck the the tree on fire. I don’t know exactly how they will portray Ben’s redemption, but I definitely see it happening, and I think Rey will play a part of it. I think it will be romantic love that puts the galaxy back together. It’s a theory I’ve heard often (even literally my mom said this was her theory after she saw TLJ) and while I don’t have anything against it, personally I’d be surprised if it happens in an explicit “Rey and Ben are a romantic pair and will live happily ever after” way. I doubt it will happen. Other than that scene where Rey and Kylo touch hands, the rest of the sequel trilogy seems weirdly asexual to me, at least in the traditional sense. Like it’s something that purposely being tiptoed around. Rose kissing Finn was asexual? I suppose the act itself is not technically asexual by its nature, but it felt about as asexual as is possible for an onscreen kiss. There was nothing in the film that built up to that kiss or even hinted at any kind of romance between Rose and Finn. They spent almost the whole movie onscreen together and there was very little chemistry between them. As for Kylo and Rey, I hope the play up the sexual tension more in episode IX, but I think having them end up together would not be a very satisfying result. 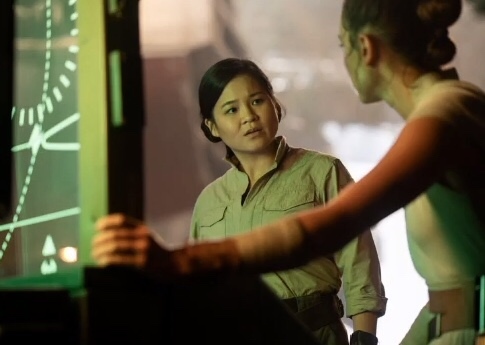 The fact is that after The Last Jedi, the relationship between these two characters is probably the most interesting aspect of the story going forward. I understand what you mean, but seeing Ben and Rey end up together could end up being very satisfying with how it’s played out on screen. That feeling was already emitted from The Last Jedi when the two began to fight Snoke’s guards. True, but I when I said “fans”, I meant Star Wars fans. This game seems like something that would be right up my ally. Even though EA showed off a story trailer, and not a gameplay trailer, I’m still going to wait for the reviews to come out and see what everyone thinks first before I make the decision to pick it up. I still can’t trust EA after how dirty they treated fans and gamers with the first two installments of the Battlefront reboots, despite that Fallen Order is a single-player game with no micro-transactions. Hopefully the gameplay is great, whereas I tried out their first Battlefront for about an hour, and I later got bored. I also hope the story is great, as it seems from the trailer. I watched the cutscene movie on YouTube for Battlefront II and thought it was quite poor and honestly, I waste of time. The last several posts were a delight to read. I just hope we all keep our theorizing in check (or at least acknowledge that we are probably wrong, despite the fun of it), as fan theories are almost always wrong and I would hate for us to ruin our enjoyment of the movie we will eventually get. That said I’m looking forward to this! Couldn’t have said it any better. Thanks, Dahmage! At the very least, I would think someone at Lucasfilm would at least check to make sure there isn’t some obscure thing out there already called The Phantom Menace, or Attack Of The Clones, the owners of which who could sue them later? Ehh…it doesn’t really matter all that much. A title is just a title. The best thing to do is to create the title that you think best suits the entirety and meaning of your feature film. Steele Saunders had just conducted an interview with Daisy Ridley after The Rise of Skywalker panel at Star Wars Celebration. Steele asks her some questions concerning this topic here. One of the things that I love about film franchises receiving DVD and Blu-Ray releases are some of the gorgeous box sets that the studios put together. They can be pricy, but still nice. The Lord of the Rings and Harry Potter have some great box sets with great artwork too. I would love it if Lucasfilm puts out a nine film box set of all three trilogies, each film with their own artwork, and nearly every behind the scene extra, featurette, documentary, and all the deleted scenes are released on the set as well. It was a real shame that the Blu-ray releases of the prequels didn’t include upscaled versions of the superior deleted scenes released with their DVD releases.